November 15, 2018 / NationalTeamsOfIceHockey / Comments Off on Latin American Ice Hockey has arrived! Juan Carlos Otero believes the future of ice hockey is South. 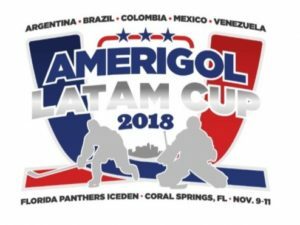 The general manager of the University of Miami’s ice hockey team since 2014, Otero is one of the founders of the Amerigol Miami International Hockey Association, which hopes to grow the grow the icy sport in Latin America by raising awareness through showcases and tournaments. A few of those seeds were planted this past weekend at the Panthers IceDen, where teams from Argentina, Brazil, Colombia, Mexico and Venezuela competed in the inaugural LATAM Cup. Of those teams, three also compete as the national teams for their respective countries. The first major tournament hosted by Amerigol, Otero is confident it won’t be the last. Prior to the tournament, players had a chance to meet several members of the Florida Panthers. The LATAM Cup featured games consisted of two 25-minutes periods with an intermission in between each. All games were free and open to the public, which led to a lively atmosphere of cheering, chants and audible pride coming from the large crowd that filled the stands at the rink. In the end, Colombia defeated Mexico B 12-3 to be crowned the tournament’s first champions. “When Juan Carlos brought this idea to me, I’m like ‘Yeah, we’ve got to do it. We’ve got to host it here under the Florida Panthers IceDen, under this organization to really show the community here what there is to offer,'” said Keith Fine, the IceDen’s general manager. “Ice hockey is alive and well. Like Otero, Fine believes the Latin American community is an untapped market for hockey. “This is just another avenue to reach that community,” he said. Looking ahead, Otero said he hopes to grow the tournament from five to as many as 45 teams, as the opportunity to add women’s and youth divisions could potentially lead to rapid growth. In the immediate future, he said Jamaica, Costa Rica, Puerto Rico and Chile could join next year. “We’re talking about 45 teams, possibly next year,” Otero said. “I’m not surprised. I really felt strongly about this. Because this is the first tournament, we really don’t have sponsorship. We have two companies, and one is my brothers. It’s been great. It’s been an effort. It’s an investment, but it’s something I feel strongly about. As for next year’s LATAM Cup, Fine said the IceDen is looking forward to hosting again. “Whatever we can do to help support it, we’re going to do it,” he said.